For private consumers around the globe the most well-known form of e-commerce falls into the business to consumer (B2C) category, which includes online retail or online shopping. It refers to online purchases from bricks-and-mortar retailers, such as Walmart, as well as from web-only online retailing corporations such as Amazon.com or Rakuten. 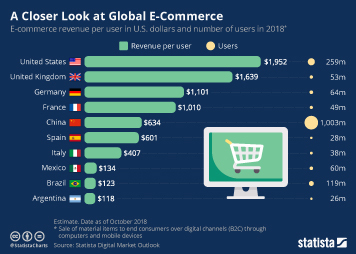 In 2018, an estimated 1.8 billion people worldwide purchase goods online. During the same year, global e-retail sales amounted to 2.8 trillion U.S. dollars and projections show a growth of up to 4.8 trillion U.S. dollars by 2021. In recent years, mobile shopping has been on the rise, with customers increasingly using their mobile devices for various online shopping activities. As of the fourth quarter of 2018, desktop PCs accounted for approximately the same amount of global e-retail orders as smartphones. However, smartphones were the number one device in terms of retail website visits. During a 2017 survey, 11 percent of online shoppers stated that they shopped online via smartphone on a weekly basis. The average online shopping and purchase intention rates among online shoppers also vary strongly by product category - clothing, shoes and consumer electronics were the most popular online shopping categories worldwide. Average shopper spending per visit was - unsurprisingly - highest in the luxury apparel vertical. Amazon.com is one of the most popular and well-known example of an online shopping platform. Founded in 1995, the Seattle-based site started out as an online bookstore, but soon began expanding its product range towards other retail goods and consumer electronics. The online company consistently ranks among the top ten leading retailers worldwide - online and offline. Online retailers are the most popular starting point for first-time purchasers but online marketplaces are more attractive for repeat buyers.